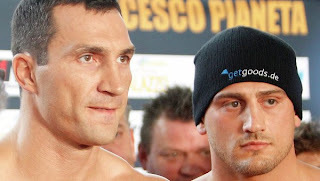 MOSCOW, Russia -- Wladimir Klitschko has retained his four heavyweight titles by winning a voluntary defense bout against Italian challenger Francesco Pianeta with a sixth-round knockout. The bout took place in the German city of Mannheim on Saturday night. Klitschko’s record improved to 60-3 with all but eight of those wins by knockout, while Pianeta suffered his first defeat in 29 fights. The Ukrainian ‘super’ champion, known as Dr. Steelhammer, now has to fight WBA ‘regular’ champion, Russian heavyweight Alexander Povetkin, in order to leave just a single WBA belt-holder. Povetkin has a voluntary title defense bout against Poland’s Andrzej Wawrzyk on May 17 at Moscow’s Crocus City Hall, which has seating for 6,178. The Russian boxer is most likely to win the fight against his outclassed challenger, experts believe. Povetkin has won all of his 25 professional fights, with 17 knockout wins. According to WBA rules, the Klitschko-Povetkin bout must take place by the end of August.